Personal health and well-being is also a part of the Evos concept. The idea is that the car will constantly be monitoring the driver’s activity inside the car. The car will also monitor the driver’s heart rate and make a determination about the driver’s overall stress level at that moment. For example, is the driver cruising the interstate listening to quiet music? Or is the driver in stop and go traffic and also searching the car’s infotainment system for something. Now imagine a call comes in to the car’s phone interface. With the driver’s pre-set permissions, the car will either route the call through if the driver is unstressed and in a safe driving situation to use the phone, or automatically route the call to voice mail if the driver is already too occupied with other things and too stressed to add yet another activity. 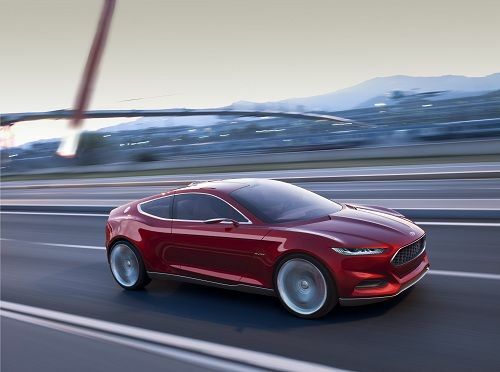 The Evos will certainly be a preview of the next Mustang and other future Ford vehicles in terms of what the auto industry thinks matters most going forward. The driver–electronics interface with the vehicle. Awesome. I'm way looking forward to driving a 2013 Mustang in a week or so.